Rockport lobsterman Steve Budrow walks toward the bow to check the mooring line on his newly acquired boat, the Mary Marjorie, as his stern man, Bryan LeClair, left, steps up to join him Tuesday in Rockport Harbor. 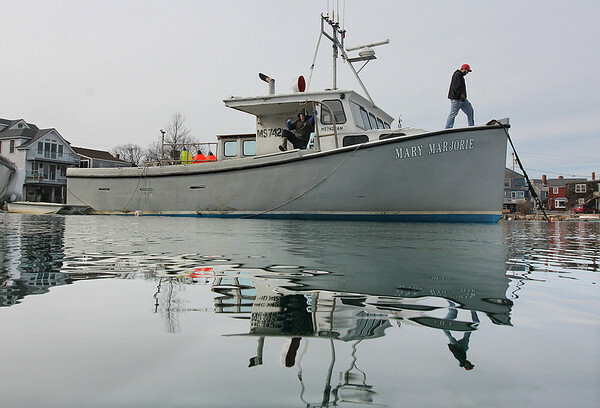 Named for Budrow's grandmother, the Mary Marjorie is a 42-foot Atkinson boat made in Nova Scotia. It will replace the Margaritaville, a 32-foot boat he has used for 11 years. Budrow said he bought the bigger boat because it's safer in heavy seas. In the smaller boat, he and LeClair have often worked shin-deep in water. "We're fishing two hours from shore in the winter months," said Budrow. "With the old boat we were basically under water all day long."